Still hugely popular! If you missed out the first time this class was taught, here is your chance to learn this techinique. 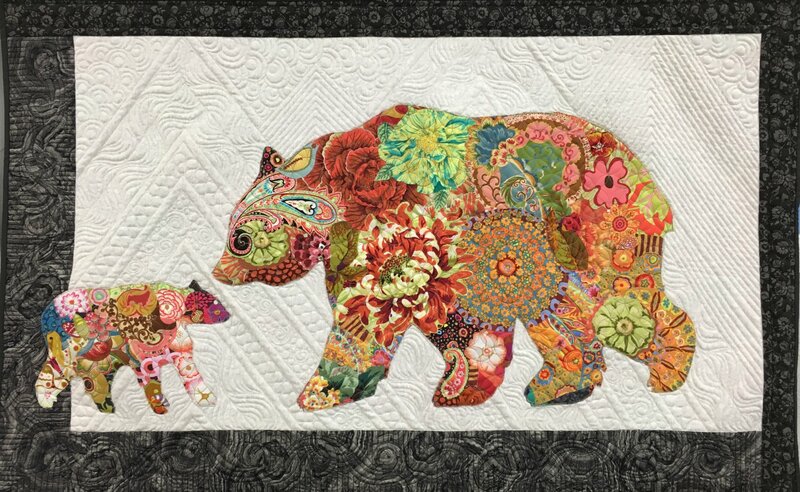 Animals are created by using a collage technique that incorporates many different fabrics. Carol will teach you this method as you create your own unique bear (or chicken, rabbit, fox, etc. ), focusing on prints that will make your animal's features stand out. You can use any of Laura Heine's patterns that are less than 36" in any direction. Class materials must be purchased at A Stitch in Time. This helps us cover class expenses. We do ask however that you check with us prior to purchasing any supplies to ensure the class has made. Pre-registration with payment is required. You may register in person, by phone, or through our website class calendar. Be sure to register early to help us ensure sufficient enrollment is met. Cancellations: If we cancel a class due to insufficient enrollment, weather, etc., all fees will be refunded. You may receive a refund if you cancel your class up to 10-days prior to class. Due to the teacher’s class planning and ordering of supplies, refunds will not be processed if you cancel less than 10-days before class. A store credit may be provided at instructor discretion only. Please cancel if you are sick. Please refrain from wearing fragrances to class. Come to class expecting a day of fun and relaxation!